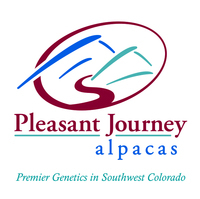 Tres Equis brings new powerhouse gray genetics to the east coast, and from bloodlines you would not normally see on a gray ARI...Snowmass XXXtreme, Peruvian Hemingway, Peruvian Bueno, PCA Peruvian Microsoft, Microsoft-Accoyo Marco Polo to name a few. Adorarosa has the interesting quality of charisma. She is the show stopper. 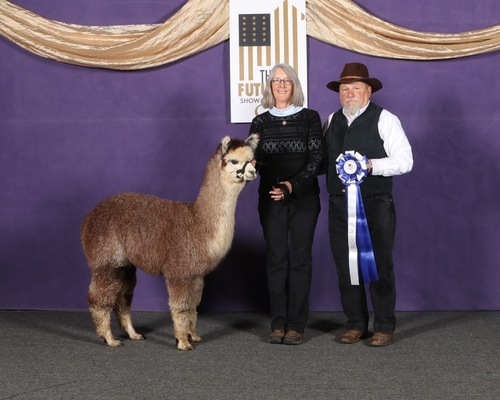 All alpacas are cute (that is why we are in the business) but she has a way of really drawing in the crowd. Her fluffy head and near perfect composition is enough to get "non-alpaca" people to stop, admire, and appreciate. If that isn't enough, she was still under 20 microns at 4 years old. Not surprisingly - She took First Place and RC at AOBA Nationals as a yearling. She is a gorgeous girl. Adorarosa has consistant coverage from head to toe making her partially wool-blind. The density of her sire, Patagonia's Lennox, coupled with the fineness of her dam, Patagonia's Sakari, has created a truly stunning girl. She is a proven dam giving birth to a gorgeous medium rose grey cria, Treasure Valley's Flirtation. 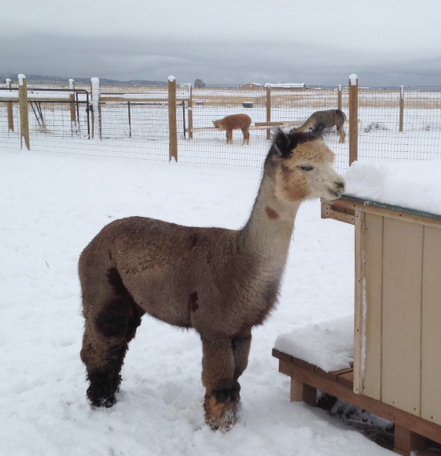 Adora gave birth to an amazing Medium Grey, and current Macpaca Herdsire, Trebicon, in 2014. She gave birth to another gorgeous Dark Rose Grey in 2015. She produces gray consistently when bred to gray! She comes with her 2018 cria out of A Paca Fun's Cavalear! Her sire, Treasure Valley's Tres Equis, is a Snowmass XXXTreme son and her dam, Adorarosa, is a Patagonia's Lennox daughter. What's not to appreciate there? Flirtation presented us with a lovely classic med rose grey female on 8/13/17!!! PJA Dixie Rose is a true beauty. 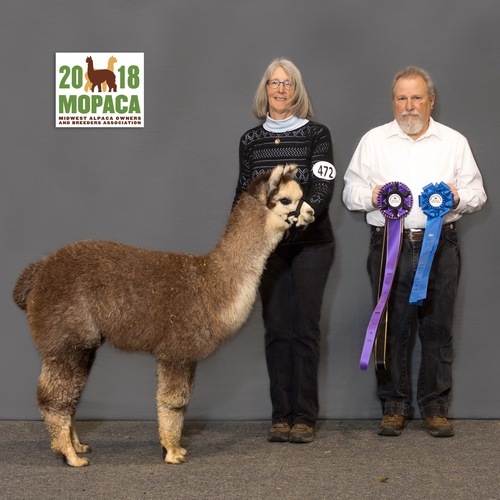 Dixie Rose took her first Color Championship at Mopaca 2018. Flirtation has been rebred to Neversummer's Manchester for a summer 2019 cria.